Alpha Omega Web Services | you select. we correct. One stop. All your web service needs. We are all about affordability. Our service offers one of the most cost-effective hosting plans available. While other big name companies give you great rates, while locking you into 12-24-36 month terms, at Alpha Omega Web Services, we offer you one price without any terms. Period. We believe with this approach, we're giving you the best rates for what is basically a monthly service, without asking for a lot of money upfront to just get the best rate possible. Website outdated? Want something new but don't have the time or know how? 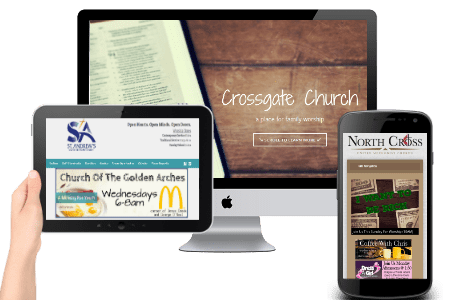 We focus and work with Wordpress themes to build your new (or existing site) into the fresh look you envision, when you choose from 1000's of available templates from 100's of various sites. During the process, we remain in contact with you with progress reports on our work, as well as any questions we may have, to ensure your new site is exactly what you desire. Upon completion, we offer a 30-day guarantee on our work and will provide any edits or changes that you find on your site at no additional cost to you. We want your business. We are priced competitively to ensure you get the best price for what your business needs. And when we say we want your business and to work with you at any cost, we mean it. We would love to customize a plan that works for you and your budget. So don't hesitate to contact us and see what we can do for you. Your success is our success. We know churches. We've worked in them. Focus on ministry, not maintenance. Know your website will be up-to-date. Trust your values always align with us. We treat your business like our own: as a priority. You clock out at the end of the day. Allow customers to buy products wherever, whenever. Keep your store items and sales in front of your customers. Be assured your business and its transactions are always safe. We understand the needs of organizations. Make connections with possible supporters. Accept contributions & donations for your cause. Keep needs and updates in front of visitors.